VGA Fiber Optic Extenders VOS-1VGA-LT/R provides for the digital transmission of 1-Channel uncompressed VGA computer video resolutions up to WUXGA 1920x1200 and HDTV RGB Component Video resolutions up to 1080p, and support one VGA loopback output for local display and dual VGA outputs for two displays in the remote end. Ideal for specialized Media Display, Security Systems, Universities, Industrial Monitoring, Airport / Airplane / Metro / Railway applications. Stand-alone or rack-mount. 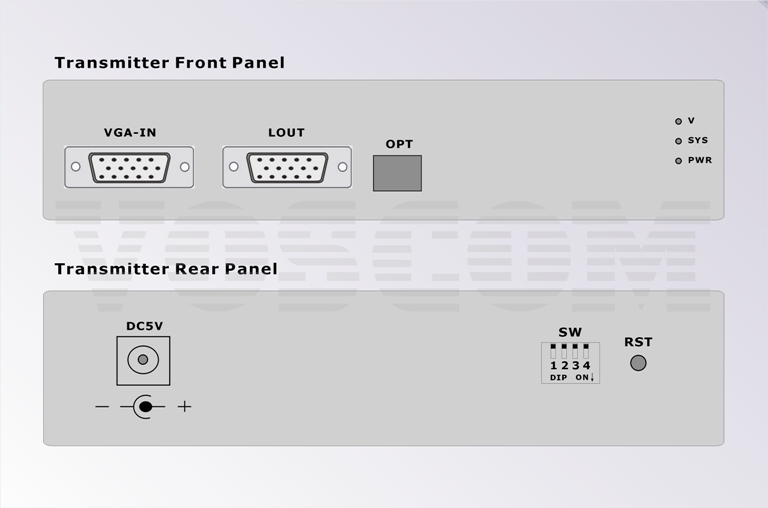 All VGA over Fiber extenders of VOS-1VGA-LT/R come in an insert card version. 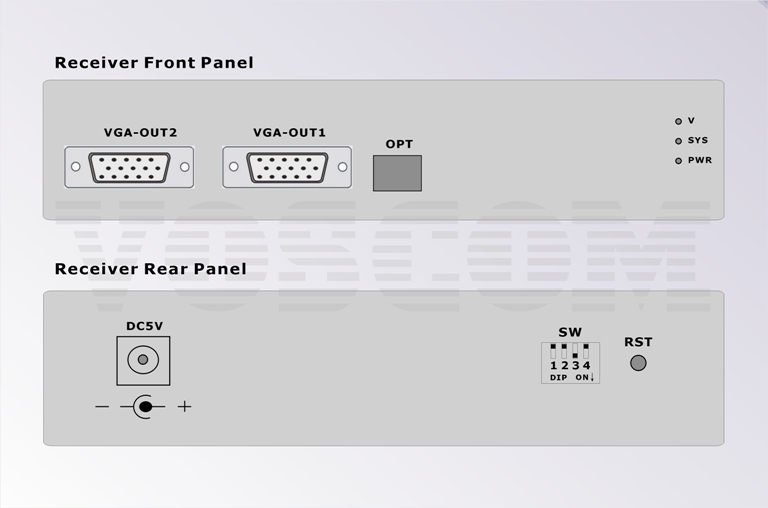 The cards can be inserted into our 16-slot, 19inch 4U rack-mountable card cage (VOS-CH04-HD16). Single-Mode or Multi-Mode, VOS-1VGA-LT/R only can support LC optical connector, the VGA over Fiber Extenders support Single-mode 15km or Multi-mode 300m over one single-fiber. • Multimode Fiber Support for Distances up to 300m. • Single-Mode Fiber Support for Distances up to 15km. • The Optical Power Budget data fit Mulit-mode(62.5/125 μm),Single-Mode(9/125 μm). • When using 50/125 μm multimode fiber, subtract 3 dB from the optical power budget. 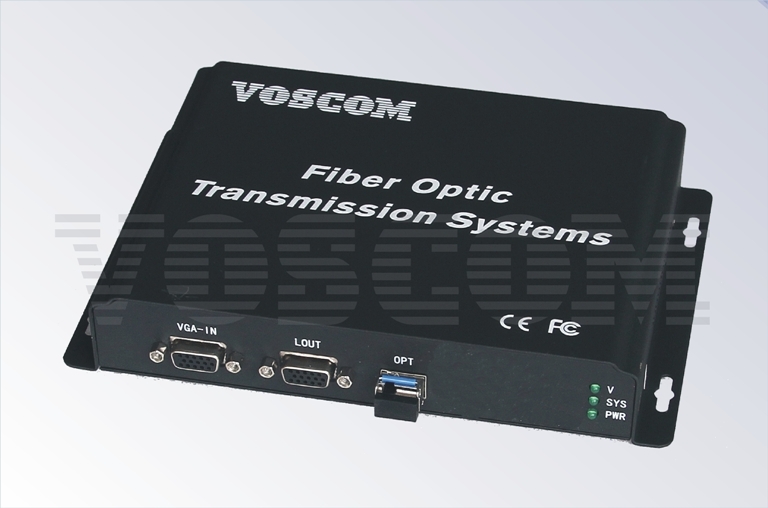 • Optical transmission distance is limited to optical loss of the fiber and any additional loss introduced by connectors, splices and patch panels. • Maximum transmission distance is also limited by fiber bandwidth. • Power adapter is manufactured by third party and is supplied with fitted screw-terminal output cables.Power adapter included (for standalone) US, European, UK or Australian power plug. • Please feel free to consult factory for any special requirement and customization. Note: Due to continuous improvement, all fiber optic extenders and fiber optic vga extender product specifications are subject to change without further notice. Easy way to get the answers you need.